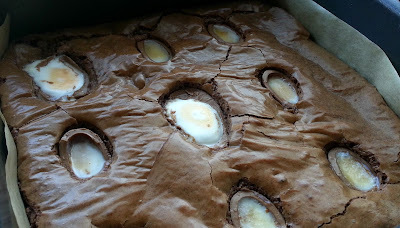 These creme egg brownies caused quite a stir on my Twitter and Facebook streams when I posted a sneak peak picture last week, it seems that people like nothing more than filling brownies with all manner of sweets and treats and this were certainly no exception. I include my brownie recipe but most people already have a 'go to' brownie recipe so just use whatever is easiest for you. 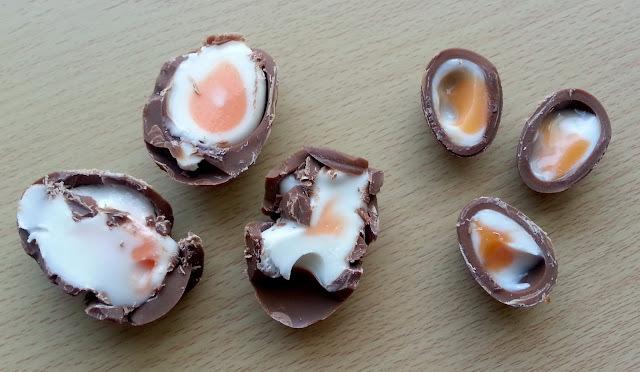 The larger creme eggs do NOT cut well! 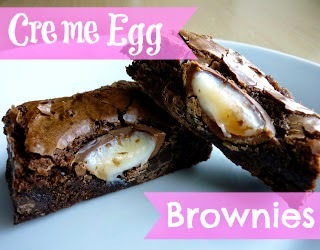 This recipe would be great to make for Easter, I wonder how mini eggs would work in brownies?? Preheat oven to 160c. Line 9" square baking tin with greaseproof paper. Set aside. Melt butter and chocolate in a medium bowl in the microwave until melted (about 2mins) Remove from microwave and stir in sugar. At this point I reheat my sugary brownie mix for a further 45secs/1min to melt the sugar as this gives you a crackly top on your brownie. Add in the eggs one at a time, stirring until smooth after each addition. Stir in vanilla extract. Gently fold in the flour and salt. Pour batter into prepared pan, and bake for 10mins. 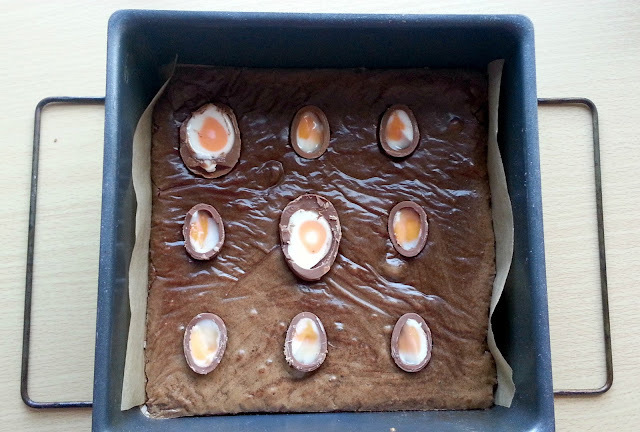 Then remove from oven and place your creme egg halves in the brownie, push them in gently or they will flatten your brownie. Bake for a further 20mins. Test by skewering your brownie with a toothpick - a few crumbs should stick to the toothpick to ensure you have a deep fudgy brownie. Leave to cool completely before even attempting to cut your brownie. I refrigerate mine for about 1hr before cutting as this gives you a nice cut edge. And if you LOVE Creme Eggs as much as me then please visit these Sarah at Taming Twins who made this Creme Egg Cheesecake, Kerry from Kerry Cooks made this insane Creme Egg Shortbread, Jacqueline from Tinned Tomatoes made Creme Egg Pancakes and Helen from Fuss Free Flavours created a Creme Egg Shake! 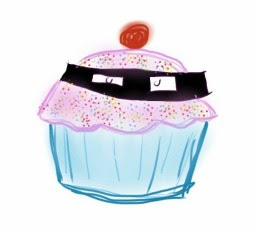 You are quite obviously a baking genius! This is such a good idea and they look awesome. 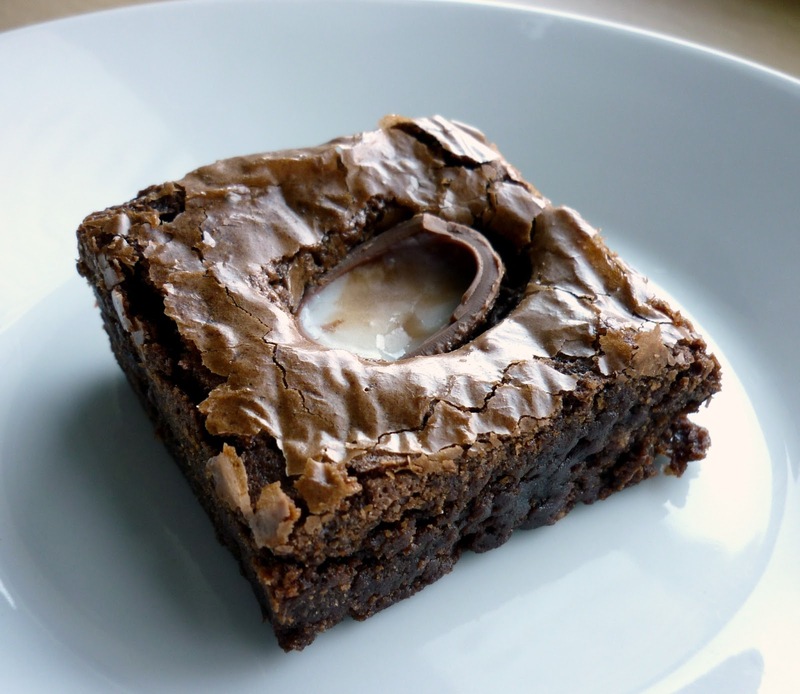 We are also making these brownies. 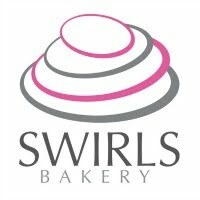 Good luck with your bake Caris! Hi Elinor, I made these in an 8" tin and I got 9 very large brownie portions out of this. 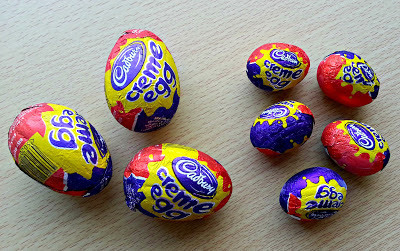 If you used more of the mini sized creme eggs I bet you'd get more like 12 brownies in total. I made theses and they are delicious, would you mind if I put a link to this recipe on my blog? Lovely brownies. Thank you for linking to my creme egg shake!